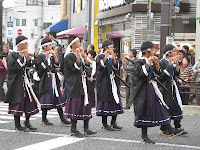 Jidai matsuri or Jidai festival is annually held on Oct. 22nd. The date of our tour was happenly on the day of 22nd. There is no choice but to go and enjoy the festival, isn't there? Jidai matsuri does not have a long history. Its origin dates back to 1895. Heian shrine was constructed to commemorate Kyoto's 1,100th anniversary as Japan's capital. At the same time, the festival started. The date of Oct. 22nd is the day when Emperor Kanmu relocated the capital from Nagaoka to Kyoto in 794. The festival's main attraction is the parade of the people dressed in authentic costumes representing in various periods. You can give a glance at characters in Japanese fuedal history. 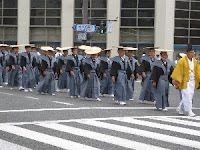 The 2 kilometer costume procession starts in the afternoon with about 2,000 comstume preformers dressed as a samurai, and common people from the earliest eras to the Meiji era ( which started in 1868). 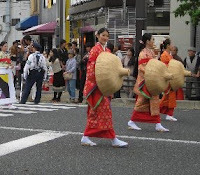 This is one of the three largest festivals in Kyoto. We started the tour from Fushimi Inari, and visited Kiyomizu temple, along with enjoying walking along the path from the temple to Yasaka shrine. 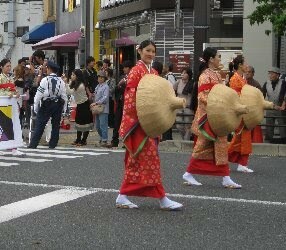 Then we headed for Sanjo street to see the festival. 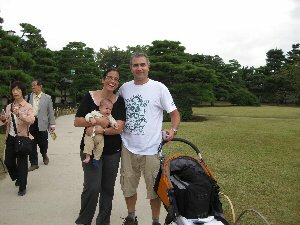 After that we visited Nijo castle. Walking in the castle and feeling atmosphere of those days after seeing the festival gave us something enough to imagine those days in the castle.